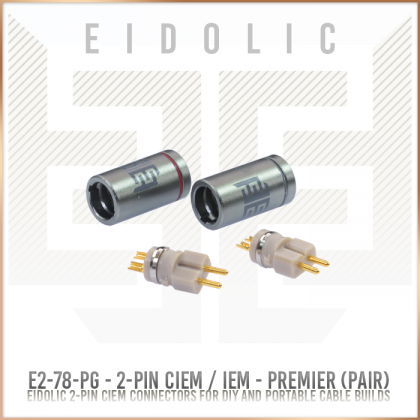 Eidolic IEM connectors are the new industry standard for durable, functional, and beautiful IEM cables. 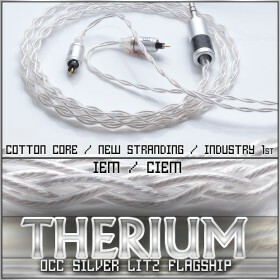 Featuring a complete re-engineering of the popular IEM connection types, the durability and fit issues that have plagued the hobbyist-grade connectors have been solved. 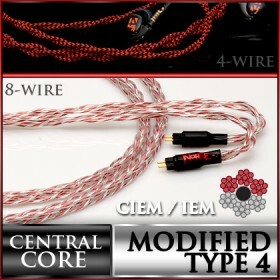 Further Eidolic ciem/ iem connectors allow anyone to build enduring, truly custom cables for most in-ear monitors. Offering a true flagship 2-pin plug, with the best possible insulators, platings, and contact material, plus an industry-best barrel locking method. Unique styling marks this plug as the completed evolution of the IEM connector. With 0.78mm pins, this model fits the vast majority of IEMs - past, present, and future - including extruded, recessed, angled, and flush sockets, with excellent ergonomics in all cases. The limited few exceptions are UE TF10 and Spiral Ears Pro which require unique plugs. 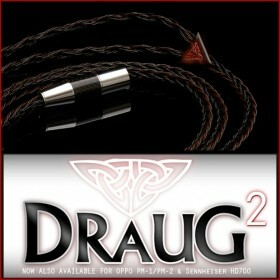 The 2 pin plugs are a perfect fit for your Noble, JH, UE, 1964Ears, and much more. The connector barrel is made of media-blasted aluminum rod stock lathed to precise specifications, with a new pure white Eidolic logo and engraved ring on each barrel. The Eidolic Premier CIEM plug easily catches the eye with a silver-white motif. We provide colored elastic rings which nest in the barrel's engraved ring as a left/right label. The Premier 2-pin connector retains the high-grade tellurium copper pins pioneered in the previous model, with newly improved solder contact cups that are easier to connect wires to. The connector features PEEK (polyether ethyl ketone) insulation - the same ultra high temperature insulator featured on LEMO and other medical and aerospace grade connectors. PEEK has excellent dielectric strength and superior heat resistance to Teflon — it will not break down during soldering, keeping the pins permanently locked in place. With the extreme thermal and electrical conductivity of the tellurium copper pins, PEEK insulation is a must. ELS is the solution to a truly efficient barrel locking system. The original and standard Eidolic design is easy to assemble when secured with glue, but ELS offers an even easier and more secure method. First, a pair of notches ensures that the contact piece aligns with the barrel's logo perfectly, preventing the barrel from rotating after it is installed. An expanding, locking ring and groove lets you simply push the barrel on until it clicks, indicating the barrel is now permanently locked onto the connector, so it is no longer mandatory to use glue to attach the barrel to the contact piece. 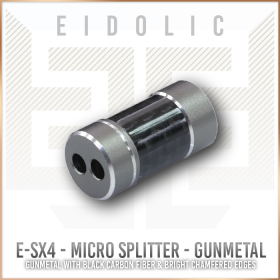 ELS is superior to a threaded connector, where the threads are so fine that it is easy to misalign the barrel & contact piece and strip the threads - this design is prone to failure. ELS avoids the use of tiny set-screws which require that the screw holes be aligned, as well as the orienting and turning of a screw with every installation. There is no easier solution to barrel retention than ELS. Gold is the most conductive surface plating that is also oxidation-resistant. It is plated as thick as dimensional specifications allow for maximum lifespan. A groove and rectangular front profile allows secure fit into various models of recessed sockets. Improved dimensions and ease of assembly. 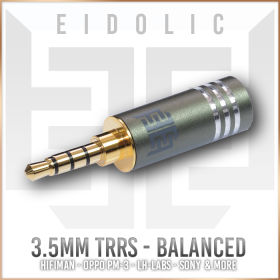 These connectors offer a little more space inside the barrel compared to other IEM connectors, allowing a variety of cables to fit and providing secure strain relief & protection of the solder joints inside. Just solder the worry-free heat-resistant contacts, push on the barrel until it clicks, then fill with hot glue for strain relief. The pins are half-cut at the ends so the wire ends attach more easily. The nonconductive, anodized aluminum barrel will not short the solder contacts in the event that it is in contact with wires or solder joints. There is no tapering on the 4.4mm rear hole to maximize the amount of glue (and wire) that can fit inside, for improved reliability. We guarantee these IEM plugs are faster and less tedious to assemble than any previous connector. Superior conductivity. The materials we have chosen for the connectors' contact pins are both durable and highly conductive, reducing the incidence of snapped pins disabling your cables and IEMs, a significant problem that Eidolic has endeavored to solve. The specific choice - tellurium copper - is 93% as conductive as pure copper, while being a strong and machinable metal suitable for audio connectors, far exceeding the 20-30% conductivity rating of brass, steel, or bronze. Years of titrating the exact right pin dimensions yields a pin that is neither too thick for brand new IEMs, nor too loose on older, more worn IEM sockets.